Minister of Canadian Heritage and Multiculturalism Pablo Rodriguez responds to a question during Question Period in the House of Commons on Nov. 23, 2018, in Ottawa. The Liberal government introduced legislation on Tuesday aimed at protecting and promoting endangered Indigenous languages, saying in the bill that years of colonialist laws caused their erosion. The legislation would create an office of an Indigenous languages commissioner and responds to three calls to action from the Truth and Reconciliation Commission. That includes acknowledging that Indigenous rights include Indigenous language rights and enacting a languages law that, among other things, preserves, revitalizes and provides funding for these initiatives. Assembly of First Nations National Chief Perry Bellegarde and Métis National Council’s Clara Morin Dal Col welcomed the announcement − but Inuit groups criticized the legislation, saying it doesn’t go far enough to protect their language. 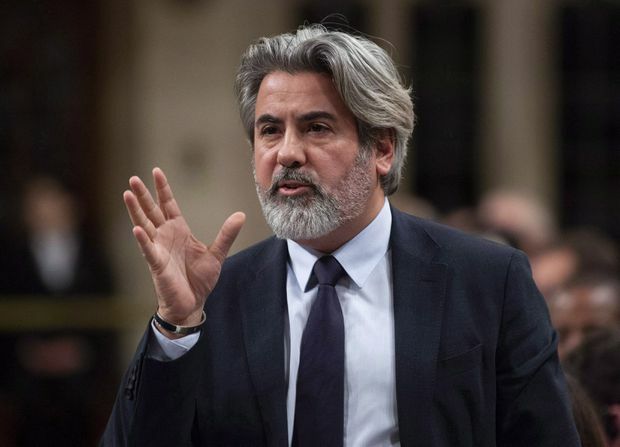 Heritage and Multiculturalism Minister Pablo Rodriguez said Bill C-91 – An Act Respecting Indigenous Languages – was co-developed with Indigenous partners, calling it a “major milestone” in the journey to reconciliation. “While we cannot change the past, we can and we must, together, work for a better future and we will do this,” he said alongside Mr. Bellegarde and Ms. Morin Dal Col. According to Statistics Canada, in 2016, 260,550 Indigenous people reported being able to speak an Indigenous language well enough to have a conversation, and the number of Indigenous people who could speak an Indigenous language had grown by 3 per cent since 2006. However, three-quarters of the 90 different Indigenous languages in Canada are at risk, Liberal MP Bob Nault said in a news release. Mr. Bellegarde applauded Mr. Rodriguez and the Liberal government for their work on the legislation, saying language is not only important to him personally, but that it’s been a priority for First Nations people for many years. “I’ve always said that our languages are national treasures. They’re not spoken anywhere else in the world,” he said, adding that language embodies Indigenous people’s world views, laws, stories and songs. “Language is culture, language is identity, language is life,” he said. But Inuit groups say the bill doesn’t go far enough to protect Inuktut, the language spoken by a majority of Nunavut residents. Aluki Kotierk, the president of Nunavut Tunngavik Inc., the group that represents Inuit in Nunavut, said that compared with other jurisdictions in Canada, Nunavut is unique because the public majority speak Inuktut. “What we were hoping to see is that rather than being a symbolic legislation that creates a commissioner’s office, that there would be real commitments for something substantial that would mean that Inuktut would become a working language of our territorial public government,” Ms. Kotierk said. She said her organization would like to see Inuit living in Nunavut feel assured that they can receive services in their language. Using education as an example, she said currently if an Inuk goes to school, they have to attend school in English. Editor’s note: An earlier version of this story online and in Wednesday’s paper incorrectly stated Liberal MP Bob Nault’s first name as Bill. This version has been corrected.